On a summer trip to Whistler, a few friends and I ditched the lift line in favor of the lesser traveled trails on nearby Blackcomb. The ride began just like any other - popping wheelies and cracking jokes as we made our way to the base of the mountain. Then the pitch kicked up a few notches. My friends and I attacked the mountain with enthusiasm, vying for position along the way. "This trail is so good you guys, you're going to love it," I promised. "Just 15 minutes more and we'll be there." For those familiar, you'll know that the climb up Blackcomb is an unrelenting beast of a fire road slog fest. Just when you think you're done you round another switchback and the view remains the same. Up and up you go. "Where's the top, man?" The mountain wasn't backing down anytime soon. As the road steepened even more, I heard my buddies begin to gasp for air and could see sweat drip from their brows. Mash. Mash. Mash. Like any good friend, I knew that moment was the time to strike. "KA-KAA!" I yelled, shifting gears and triumphantly passing by the crew with one hand on the bars while casually spinning away. It was then that I fully realized just how great SRAM's new Eagle drivetrain is. It felt like I was like cheating and I loved it. Since the invention of the mountain bike, people have been "earning it" by climbing up hills before cashing in on well-deserved descents. Eagle's incredibly wide range makes it easier to do just that, plus it's flat out a better 1X drivetrain. After nearly eight months and several hundred miles of use, it's time to fill you in on how things are holding up in the long term. For those unfamiliar, Eagle is SRAM's latest 1X drivetrain, complete with 12 speeds out back and a massive 10 to 50-tooth cassette that makes 8-inch brake rotors look tiny. It was created as the company's answer to 1X holdouts by providing a huge gear range, but also served as a chance to improve many aspects of the 1X system. With the introduction of a larger cassette, new chain, revised chainring design, updates to the derailleur, and cranks featuring a better carbon layup, every component has seen some major updates. You can review the changes in detail in our SRAM Eagle First Look, First Ride feature. 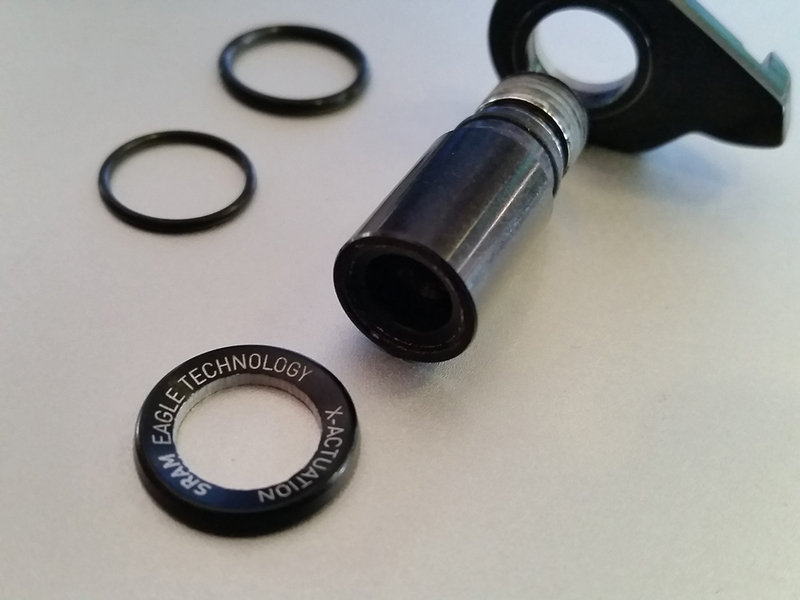 Best of all it works on normal bikes - if 1x11 will fit your ride, 1x12 will too. From the goods in Whistler to the winding trails of Squamish, Durango's high country epics, Moab's classics, and a mix of rides in Sedona, Tucson, Hurricane, Italy, and Vancouver Island, I've spent a fair bit of time getting accustomed to Eagle and how it works. An X01 Eagle drivetrain was mounted to a 160mm travel enduro bike back in June 2016, complete with a 32-tooth chainring and the new X01 carbon cranks. From the very first ride, there was a sense of smoothness to Eagle that was hard to miss. Compared to SRAM's previous 1X drivetrains, there's less noise, less grinding throughout the full range of gears, the shifter is slightly easier to press into the big cogs, and shifts themselves feel more refined and less clunky. You also get the feeling that there's less friction in the system. Much of this is due to the new chain design and manufacturing process, which makes use of rounded chamfers on the inside of the links as opposed to harsh edges. SRAM's previous 1X drivetrains are prone to lots of noise and grinding on steep hills while mashing in the biggest cog - especially during poor weather conditions - but Eagle put an end to this from day one and has continued to remain grind-free ever since. Shift progression up the cassette is slightly improved as well, which is most noticeable when faced with an unexpected climb. The ability to shift up five gears with single lever push proves to be very useful in these instances. Paired with a 32-tooth chainring, the 12-speed cassette provides a good gear for pretty much every mountain biking scenario. The cassette has the same gear spacing as the previous 11-speed cassette, but this time they've tacked on an aluminum 50-tooth cog to complete the package and give 500% range (up from 420%). Tooth counts are 10-12-14-16-18-21-24-28-32-36-42-50 with progressively larger 2-2-2-2-3-3-4-4-4-6-8-tooth jumps. Despite the large jump to the big cog, I never found it to be a hindrance to my cadence. If anything, I'm in the hurt locker anyways when it's needed. I'd forgotten how nice it is to spin up hills, and find myself making it up more climbs with more energy to devote to the ride back down. On the easy end of the gear range, a 32-tooth chainring with Eagle is equivalent to a 28-tooth chainring on SRAM's 11-speed drivetrains. This makes for some serious climbing ability without the need for mashing, which my knees are thankful for. Given the increase in the front chainring size, I find myself mid-range on the cassette more often. This means less wear and a better chainline. The days of sizing your chainring for the climbs and losing speed on the downs are over, and there's plenty of gear available for hauling down the hills. Backpedaling is greatly improved thanks to X-SYNC-looking teeth on the easiest two cogs, which also help with shifting. Where SRAM's previous systems would often skip down a few gears when backpedaling (like while ratcheting the cranks during technical climbs), Eagle goes unfazed and spins smoothly. Thanks to the removal of the narrow/wide tooth profile on the upper derailleur pulley, I've also had no issues with the chain getting misaligned. You can now throw the cranks backwards in the largest cog without issue, which is very impressive. The new clutch mechanism in the derailleur has a smoother torque curve for quieter, more consistent operation and feel. It delivers a smooth yet firm hold on the chain that's less grabby/sticky than many have come to expect. Combined with the new X-SYNC 2 chainring, the bike had just two chain drops during the entire test period. One of the drops occurred on Whistler's A-Line trail while smashing through some massive brake bumps into the first corner - a truly testing scenario for an enduro bike. I've experienced zero skipping since the day it was installed, a testament to the derailleur's lack of movement when the chain bounces. While the cage can rotate forward and backward, the derailleur's side-to-side position relative to the cassette remains unchanged unless you're shifting. I switch between two test bikes regularly, one of which was equipped with a new 11-speed X01 drivetrain at the same time Eagle was installed on the other. The two bikes saw an equivalent amount of use during the seven and half month test period, and as a result comparing the durability of the two is revealing. The 11-speed drivetrain is beginning to feel worn - there's a good amount of wear visible on the chainring and cassette, some grinding in the largest cog, the derailleur has loosened on the hanger a number of times, the clutch is less effective, and there's creaking when you push/pull sideways on the derailleur cage. Eagle has suffered from none of those issues. On Eagle, the chainring shows more even wear on both types of teeth - narrow and wide - suggesting a better fit on the chain. While there is some deformation on the tall teeth, there's no "hook" forming like in the past, which was the cause of many grinding issues. The longer positive-rake tooth shape is said to last four times longer, and so far I have no reason to doubt that claim. Running a bigger chainring means you're likely to hit rocks more often, so I'd suggest a bash guard if riding chunky terrain. One smashed rock caused a very sticky chain link that took a good deal of effort to fix. Both chains remain in good condition, as verified by a chain checker, and the black coating on the Eagle chain still looks great despite several sandy and grimy rides. While testing Eagle on other bikes I did witness two broken chains, both by flat pedal riders while shifting uphill - a worst case stress scenario. SRAM strongly suggests using the included red plastic chain gap tool during setup to help eliminate a common cause of busted chains. The Eagle X01 crankset is gouged and scuffed from rock impacts, but continues to perform without issue. The new carbon layup and foam core provides good reassurance in the strength department. Cassette wear is minimal, which is perhaps Eagle's best durability attribute given the high cost of a replacement. There is very little wear on the big 50-tooth aluminum cog with only faint hints of wear on the sides of the teeth, but the tooth shape isn't showing signs of excessive wear. The finish on the chromoly steel cogs also seems to be lasting longer, perhaps due to less friction from the updated chain design. A new bushing in the B-plate solves the "creaky clutch" issue that plagued many SRAM 11-speed derailleurs. Turns out this wasn't the clutch after all, but instead two aluminum parts seizing. This change allows the derailleur to reliably rotate independently of the mount. Combined with new forged ridges designed to grab hold of the hanger better, the derailleur has only ever loosened once following lots of hard smashing on Moab's Amasa Back trail. Even then it was just over an eighth of a turn loose. Best of all, the Eagle drivetrain required very few adjustments following the initial setup. A few quick turns of the barrel adjuster is all that's been needed, and cable tension has been easy to dial in and find the sweet spot. Chainring availability - At the time of its launch, Eagle was only available with a 32-tooth chainring for aftermarket purchasers. Riders looking to size up or down may prefer a different size, though we've found the stock size to be excellent on 27.5-inch wheeled bikes. Increased chainslap in hard gears - Due to the length of the chain needed to accommodate such a wide range cassette, the derailleur has a tough task taming chainslap in the hardest 3-4 gears. I noticed more noise while descending on rough terrain. Whether or not the clutch can be tightened isn't something SRAM discloses. Less derailleur ground clearance - Your visual assessment is correct. Eagle's massive cage length and redesigned derailleur body stick down and out further than their 11-speed versions. The Cage Lock mechanism has been moved out of harm's way to improve things, but even so our measurements confirm that the derailleur is closer to the ground and trail obstacles. The derailleur body protrudes out ~5mm more, the bottom of the clutch rests 8-15mm lower depending on the gear combo, and the cage sticks down an additional ~32mm in the easiest gear. I managed to scuff up both the cage and body, though neither resulted in any real issues. SRAM claims Eagle has more clearance than competing 2x11 drivetrains with comparable overall range. SRAM's Eagle drivetrain has proven itself as a better 1X drivetrain, highlighted by a smoother, more refined feel and massively improved durability. The extra range provided by the incredibly machined 10 to 50-tooth cassette allows you to both climb more easily and descend at higher speeds. Those who find themselves searching for "one more" will love being able to spin their legs again, and those who could muscle SRAM's 11-speed drivetrains without issue will rejoice in other less obvious benefits. While the cost is high following Eagle's introduction, it's an excellent upgrade for those who can swing it. I ran X01 Eagle on my bike for three months over summer. Riding a few times each week and racing 4 one-day enduros and one 6-day trans event. I had numerous problems with Eagle. Not so much in terms of shifting. It moves up and down through the the block quickly and consistently. (Though it's very important that you have and use the red plastic B-tension adjustment tool, as its B-tension quite sensitive and continually goes out of adjustment). I also had the upper jockey wheels and inner plate fail catastrophically on two occasions, resulting in chainless riding and long walks out. I also have been present on four other instances where the same thing has happened to other riders, in some instances ruining races and podium hopes. I have no doubt that Eagle's claims that it is suitable for all riding types in all types of terrain is quixotic in the extreme. Basic physics suggest that any derailleur is going to have a hard time controlling chain slap on the very long chain required for a 10-50T range. This is especially true on a bike with long travel (unless the clutch is set so stiff that it would negatively impact the suspension, which the Eagle does not do). Eagle will be fine for a rider who only rides smooth flow trails or XC circuits. On fast chattery brake-bumped and rocky trails it simply isn't up for the task, ditto for big jumps and deep impacts. It also hangs down a long way and sticks out to the side much further than shimano mechs. I never smashed one off but I did bend two mech hangers, and was always worried when riding some of our local trails which sometimes have axle deep ruts. I swapped the Eagle off for Shimano XT/XTR shifting gear on a GX block. Couldn't be happier with the performance. That said I would have been equally happy with a Sram 11sp setup too. The 500% range is a nice to have, not a need to have. (I hardly ever needed the 50T, even on big alpine climbs). And the flaws of Eagle in my experience are significant enough mean that is a poor choice for any rider who is riding hard. Also its stupidly expensive to replace.